Trumpet Champagne Flutes and Glass Ice Bucket Set (P/N 17337). Watch your bubbles rise in these retro mouth-blown trumpet champagne flutes, mouth-blown in Romania from non-leaded glass. Minimalist design and clear glass can be filled with ice to chill wine or Champagne, making a beautiful centerpiece for your table. A solid base provides ample support for up to 2 Champagne bottles. Made in Poland. 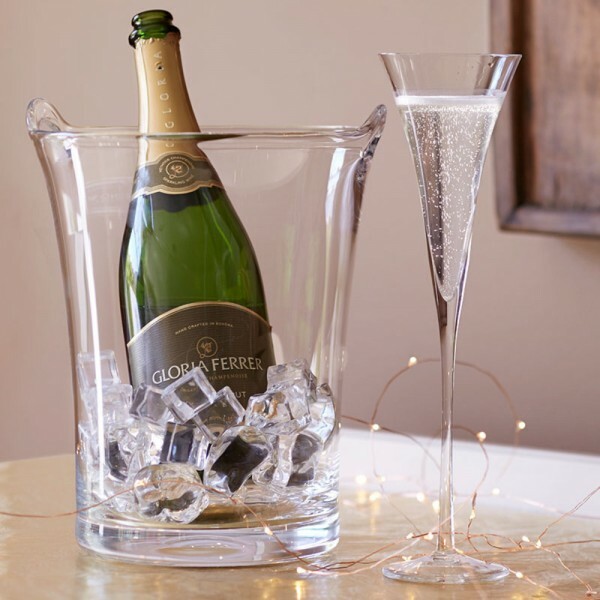 Display and chill your Champagne in this clear glass bucket filled with ice, and when you're ready to celebrate, serve the Champagne in our trumpet champagne flutes.